When going out for a nice meal, I want more than food—I want a dining experience. That is something seldom found in the Bristol (Tennessee/Virginia) area that J Frank’s offers and executes, topnotch. Somehow, I missed the chatter of a new fine-dining restaurant opening in my hometown. However, thanks to my friend Sabrena Snow, who works at a shop whose owners were acquainted with the proprietor of J Frank’s, it didn’t take long to learn of the great news. The restaurant is located in a beautifully restored 1850’s Victorian home. The house itself is rich in history and offers a unique dining environment. It was originally built by the Vance family of Bristol, confiscated during the Civil War, and later returned to the family. Since then, it has been restored and home to two fine-dining restaurants. J Frank’s predecessor was the Troutdale dining room, which closed its doors for financial reasons in summer of 2015. Entrepreneur Jason Vanover saw the opportunity for a new fine dining outlet in Bristol, and opened the doors to J Frank’s on December 19, 2015. The restaurant’s menu features small plates and entrees, as well as a full-service bar and wine list. Snow and I enjoyed dinner at J Frank’s on a Thursday evening, with a considerable crowd for Bristol on a weeknight. I was introduced to Vanover, the restaurant’s charming owner, over cocktails and light, succulent crab hushpuppies (after he asked what we would like and we responded with, “surprise us!”). We then made our way to our table, which was in the corner of a small room with a crackling fireplace, large windows, candelabras, and huge leather chairs at the tables. 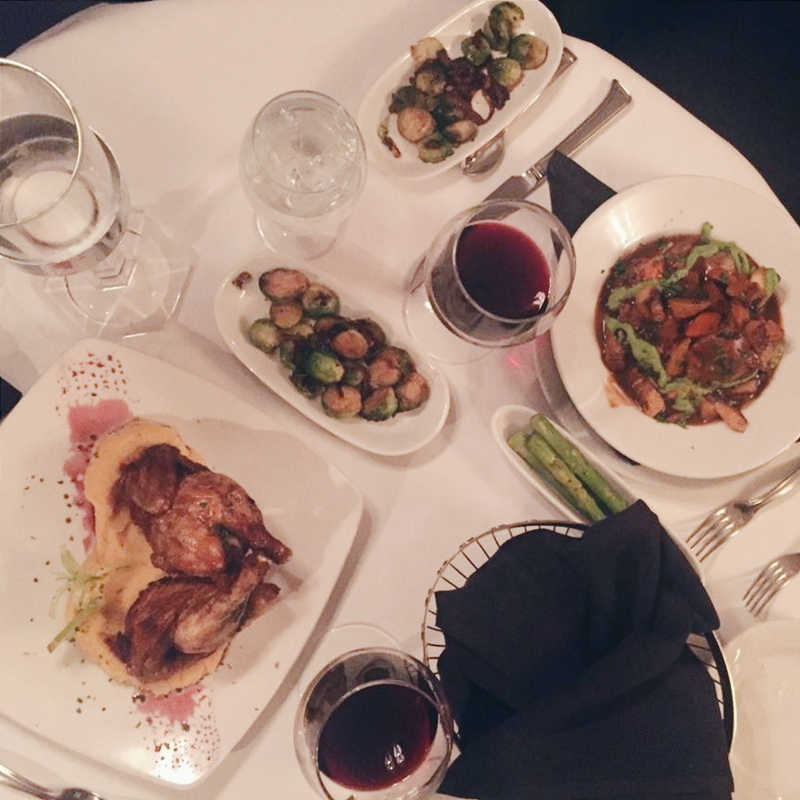 Vanover treated us to the osso buco and the Cornish hen for our entrees. It goes without saying that our meals were each divine. The classic osso buco was perfect for a chilly evening, and the Cornish hen was perfectly paired with velvety Yukon potatoes and a tangy-sweet pomegranate sauce. We were completely stuffed after our meals, so we decided to come back another time for just desserts and drinks, and bring along a few others who will appreciate the J Frank’s dining experience as much as we did. They also serve a Sunday brunch, which we plan to return for. J Frank’s is located at 412 Sixth Street in Bristol, Tennessee. Current hours of operation are 5 p.m. to 10 p.m. on Wednesday and Thursdays, 5 p.m. to 1 a.m. on Fridays and Saturdays, and 11 a.m. to 2 p.m. on Sundays.